Sometimes you get in a rut and you have to change things up just to stay motivated to keep going. I have been using our EasyLunchboxes since my oldest two were in preschool. I still have my original set, and they are still awesome. 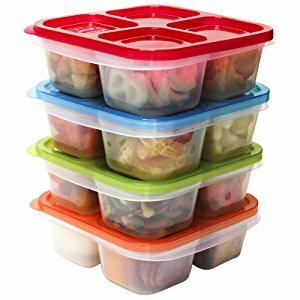 They are absolutely still my top recommendation for basic, easy, and cost effective lunch packing. But, I have to be honest, after 6 years, of multiple lunches every day, for 180 days of school, I just got a little bored with them. I was having a hard time figuring out why I just couldn't get motivated for lunch packing this school year, and trying to figure out what I could do to get my groove back. And I finally found it. New lunchboxes! I've been using the Yumboxes for a couple weeks and I am having fun making lunches again. I love all the bright colors, and the little sections, and the fact that they are totally leakproof is just opening up a lot more easy lunch choices. I've known about these boxes for a long time. We had a snack sized box for a long time, and I've loved it. But I resisted buying the lunch size. I had a few reasons, one being storage space and another being price. I make four lunches, so that adds up in terms of buying lunch containers. But I finally decided I was ready to try them out. At first I bought just one and used it for a week or two. And I fell in love. I don't know if I can even tell you exactly why, but they really do make it more fun. I love getting creative with what I can put in each little section, and there are things I am packing now that avoided packing before. When they say these don't leak, they aren't kidding. I have packed ranch dip, yogurt, applesauce, jam, ketchup, and more - without a single leak. The lid closes really snug - but it's not hard to close! That's one of my criteria - it has to be easy to open and close. With one simple latch, all of my kids can easily open this and close it. I like that the lid is hinged - I was having a problem with one of my kids somehow leaving the lid off their EasyLunchbox altogether - so we had leftover lunch just loose and floating around in the lunch bag. But this one he closes. It's a great choice for little hands, or for someone with special needs who has a harder time opening and closing something. The regular size comes in two different configurations - a four compartment and a six compartment. I got a couple of each. I love them both. People who pack a lot of sandwiches or other bigger things will want the bigger space in the four compartment box. If you pack more smaller nibbles, then the 6 compartment is great. I love both. The 6 compartment is especially awesome if you are having a hard time knowing what to pack, or if you have kids who are learning to pack their own lunch. Each section is labeled with what should go in it - protein, fruit, veggie, etc. As far as my two initial reservations, I'm over them. They are more expensive, but they are really sturdy and well made. I know people who have had these for years and they say they are still like new. The good news on the size is that they are basically the same exterior dimensions as our other containers, so they fit in all of our lunch bags just perfectly. They store just fine, I just stack them or line them up vertically. Also, they come in fun colors, which is never a bad thing. So - if you are looking to try something new - you can't go wrong with these!